These guys seem to be happy fiddling, but the combination of Sander, rowing electronics, and fiddling is not a pretty sight. 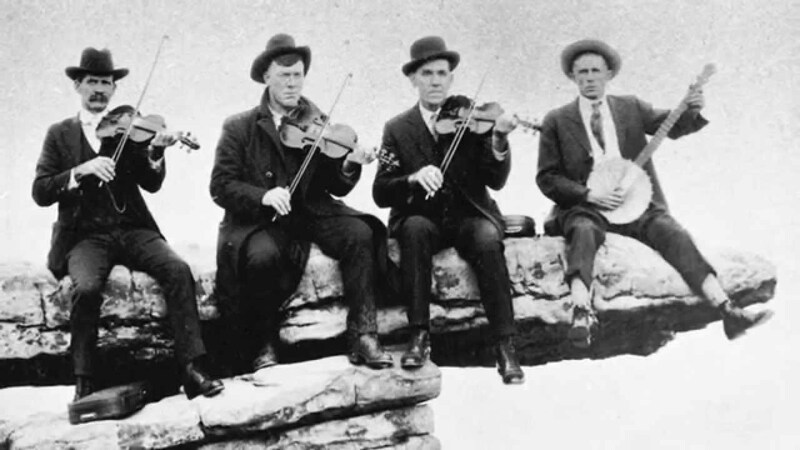 Today there was too much fiddling with the Quiske app. I had moved the sensor to under the seat, but I am always uncertain about the correct orientation of the pod, and there is no quick google answer to that. Quiske has a couple of user guides and other documents, but all I need is a simple table which I could print out and put on the inside of my locker door. I think I got this correct, but I need to check it. What added to my frustration is that the Quiske app sometimes doesn’t update the lines. The only way to get it to behave again is to go out of the application, kill it, and start again. Or, at least, that seems to be the procedure. On the water, of course, I am trying out all kinds of menu and settings combinations before I kill the app. When I had finally set up my gear correctly at the end of the warming up, I was happy to find myself alongside another Masters team. In the spirit of GDPR, I shall not reveal who it was, but suffice to say it was a big, coxed, sweep boat. And there were eight ladies in it. Of varying age. The prettiest lady being Martin on stroke seat. 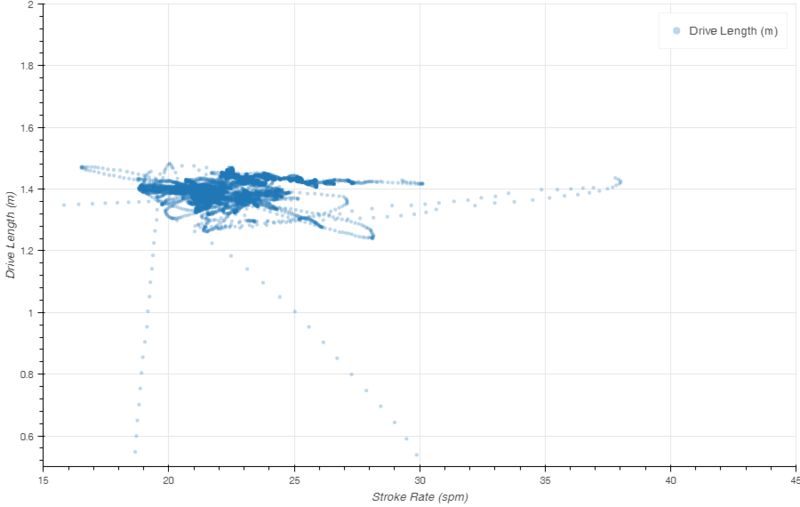 So, of course, I wanted to focus on technique, get some good Quiske curves measured at various stroke rates, but I also wanted the eight to not pass me. We did three full lake stretches of about 3 kilometers each, and the score was 3-0 for the single sculler. Well, in the first two stretches the eight was also doing technique drills, but in the final one, they were rowing at a steady pace. The summary table shows the splits for the pink intervals shown on the chart. Looks like it was a bit harder training than intended. Well, I don’t think it hurt me. A bit of good sparring with random other crews (preferably when they are not aware they are in a race) is always healthy, I think. It pushes me a bit further. And now follows a whole bunch of Quiske charts. An interesting observation. 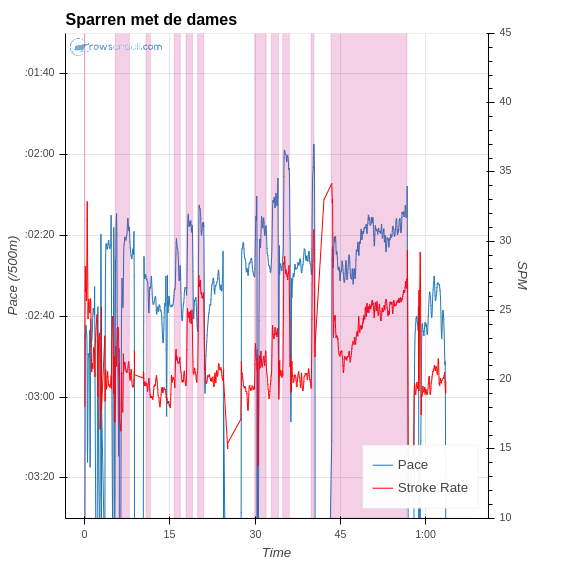 At 22spm, my seat is accelerating during the recovery, but as stroke rate increases this acceleration disappears and at 28spm (and higher) the maximum seat speed is during the middle of the recovery. 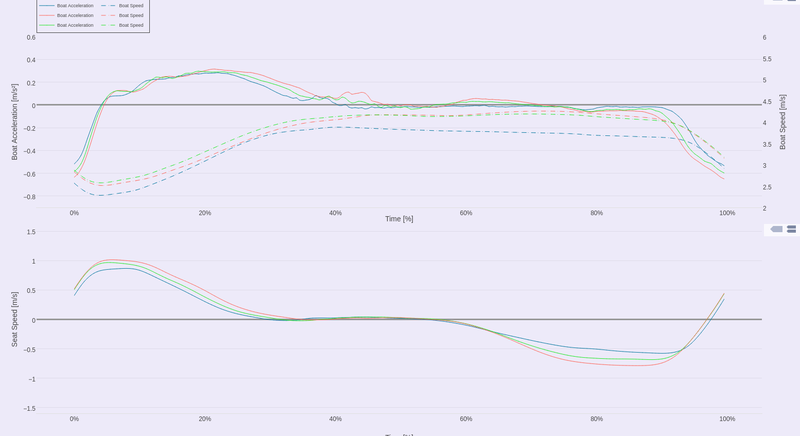 Seat speed during recovery is, for me on the single at least, an intuitive thing. I hope I am trying to not slow the boat down too much, but to be honest I am not sure how I determine the subtle things (or not so subtle things) I do on the recovery. I did not try to change my natural rowing style in this outing. I just wanted a good baseline of my current style. So what can we learn from this chart? To me the most significant point to notice is how much the boat slows down after the seat speed reversal. What Quiske cannot say if this is before or after the blade has entered the water. Here is a “powerpoint attempt” to determine this. Maximum boat deceleration point (Quiske stroke cycle start). Both the scull and the seat are moving. Quiske doesn’t tell if the blade is already in the water or not. During my rowing, I am making nice “V” splashes with the blade. That means that at entry, the blade is not moving in the reference frame of the water. However, because the boat has a non-zero speed, this means that I must be already moving the oar (and seat). At this point, the seat speed is about 0.56 m/s, the oar angle velocity is about 29 degrees per second from the measurements) and the boat speed is 3.1 m/s. If I wouldn’t open my back, then with my rig, the seat speed would translate to a blade speed creating a forward splash. If I look at the oar angle speed, the blade hits the water with a slightly negative speed, creating a backward splash. What happens in reality, I think, is that the blade enters the water a bit earlier than the Quiske stroke cycle start. The conclusion that I am opening my back still holds though. Interesting. Need video evidence. I have drawn the second black line at the point of maximum seat speed. 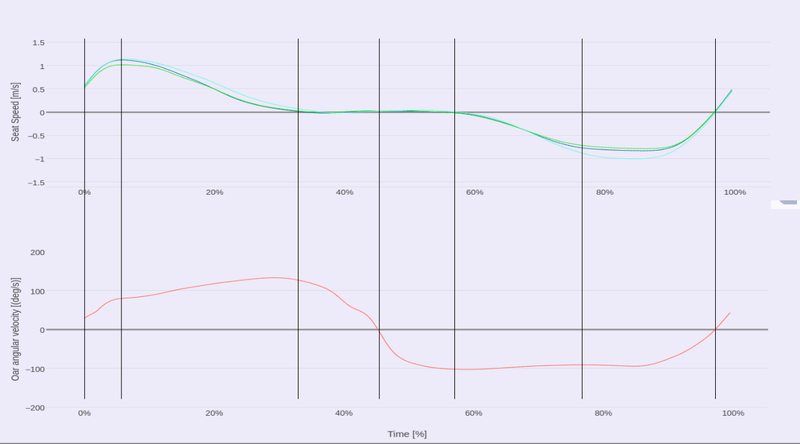 What I find interesting here is that the oar angle speed curve shows a more pronounced bend than the seat speed curve. That would suggest that I stop opening my back here. After this point, the seat speed starts to decrease while the oar angle velocity keeps increasing. This is where I start the back swing. The third black line is at the point where the seat stops and my oar angle velocity is close to maximum. I suspect that this is close to the moment where I end the back swing and start the arms only phase. The fourth black line is at the point where the oar changes direction. This is slightly after the tap down. The fifth black line is at the point where my seat starts rolling again. Arms are away and, hopefully, the body is rocked over. Or is it? The sixth black line is at the end of seat acceleration. 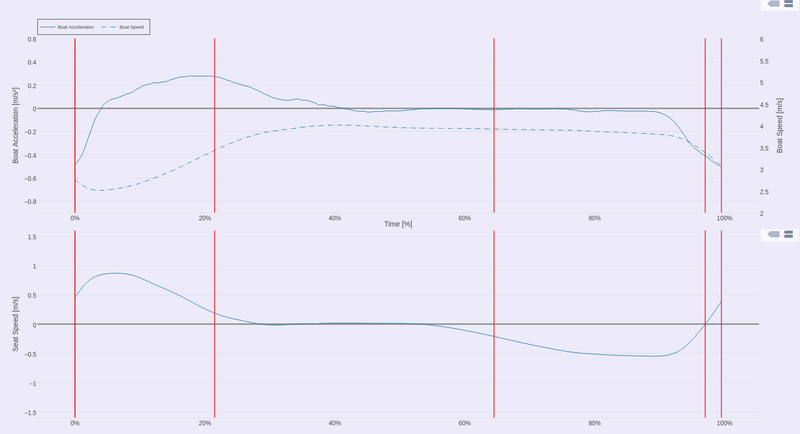 You can see that during the entire seat acceleration phase, the oar anglular velocity is roughly constant. That suggest that my body rock over hasn’t fully finished when my seat starts to go towards the stern. This is not necessarily a bad thing. After this line, there is a phase where seat speed and oar angular speed seem to be coupled well (taking a cosine by eye! ), which indicates that during the second half of the recovery I am already in catch position. The seventh black line is the point where seat and oar angle reverse. These points coincide. Nice. This is also just before the catch. Interestingly, this set of measurements shows no sign of any funny movement just before the catch, like an extra reach or anything. I am sure Olympian rower have better timing around the catch than I do, but all in all I don’t see any big flaws, apart from using a back opening to do the catch. And that’s a long story to say I need side video analysis. I managed to get to the lake before work, but not early enough to do more than a 12k workout. I actually think that is a good thing, because I was still feeling tired from Monday’s Pete Plan Pyramid (OTW version). The plan called for steady state (16k) but I decided to use the shorter format to spice it up slightly. I went for rate ladders. Our lake is a little under 3km long from “Rokle” to “Sirka”. (You can actually do a full length 3k if you row from “behind Rokle”, but then you have a turn at the beginning.) So I decided to do 1k/750m/500m/250m/rest of lake at 18spm/20spm/22spm/24spm/16spm. So I would gradually rate up, trying to hold just under 600 J on the Work per Stroke metric (Empower Oarlock), until a 250m at 24spm, and then I would fall down to 16spm, while still holding 600J, until I ran out of lake. A turn, sip of water, repeat. There was a slight wind when I started (tailwind in the first set, headwind in the second) but the wind strength was decreasing as the session progressed. I think that explains the spread of pace values. Perhaps “just under 600 J” is a bit too much and my natural stroke should be in the 500-550J range? 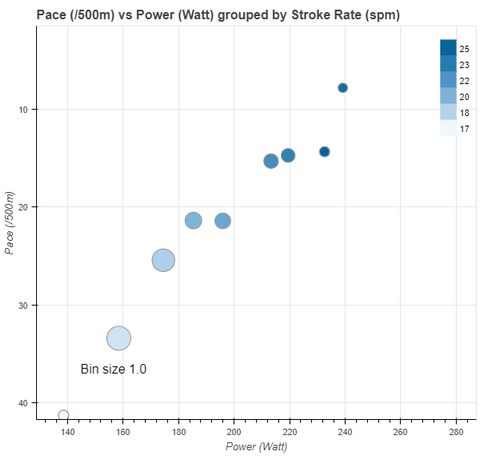 Looking at the trend for race pace strokes (chart below), I have been rowing them at a higher Work per Stroke. Wrongly, perhaps? Anyway, glad that I have the data allowing me to ask those questions. 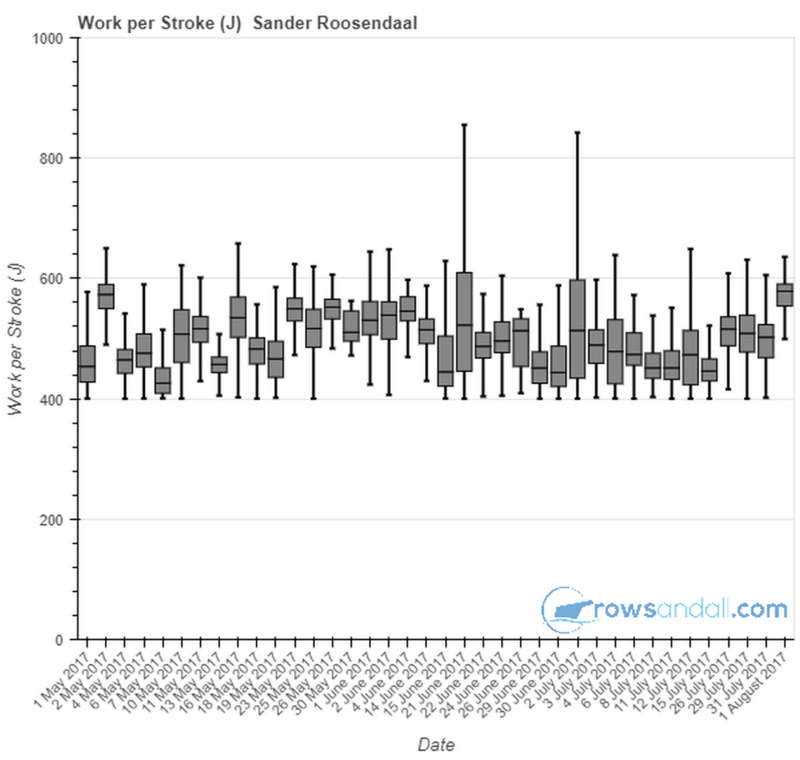 At rowsandall.com, I and a few other rowing data enthusiasts are building a platform for analyzing rowing (OTW & OTE) data. 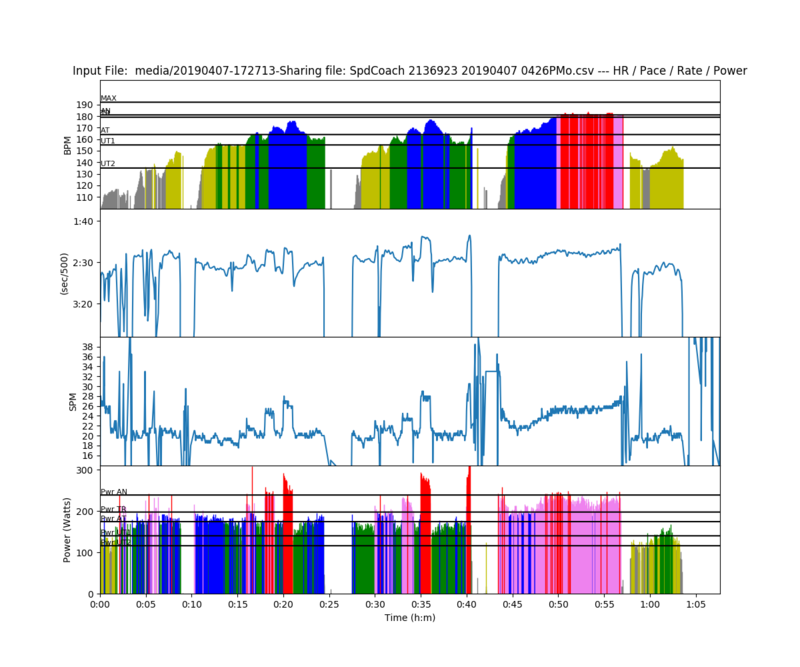 This all started back in May when Greg Smith (Quantified Rowing) developed a Python script to work with the Painsled iOS exported stroke data. I added a TCX parser and then quickly expanded the toolbox with a few other rowing data formats. The next stage was to develop a simple Python driven web site for users without Python knowledge. It took a few months to make something usable, but even though we’re still in beta mode, the current pages are pretty usable. We’re currently supporting CrewNerd, Rowing in Motion, Ergdata, Ergstick, NK SpeedCoach, RowPro and Painsled. Also, you can import data from Strava, SportTracks and the Concept 2 logbook, so it should be easy to get your data in the tool. Also, we will be ready for Power data from the Empower Oarlock once it’s shipped. The user interface of the pages is not the prettiest, but there are some YouTube videos to get you started. 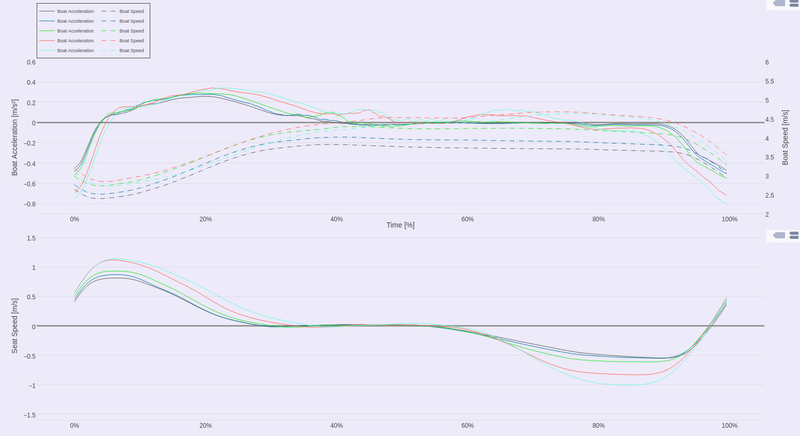 On top of the basic plotting of your workout, we are starting to add some Meta Analysis features, where you can look at your accumulated data (all workouts in a certain date range, for example). We’re really just starting to explore the possibilities, so here are a few teaser plots. The data are my erg rows, between August and today. 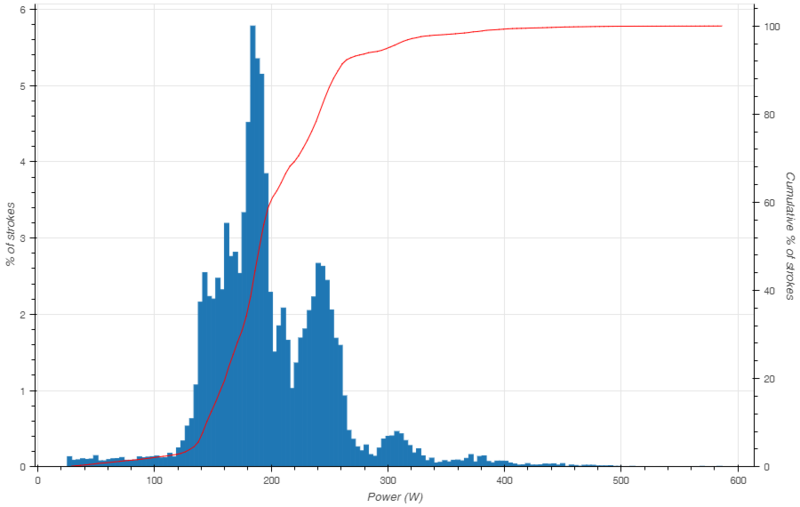 Here is the Power Histogram. It shows you the percentage of strokes at a given Power. 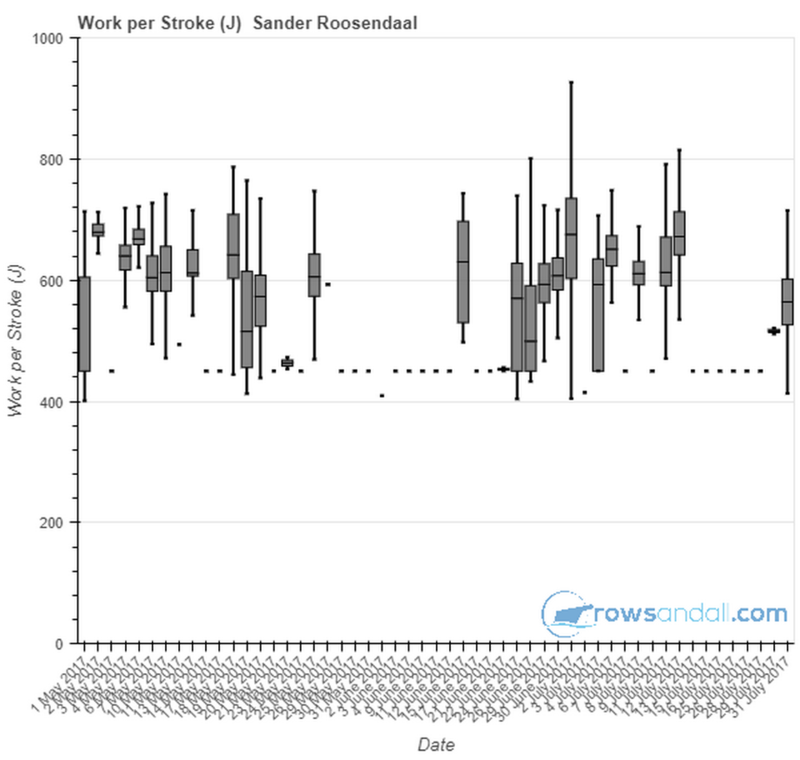 So, for example, you can see that I have been doing most of my strokes just below 200W, which is my steady state power. Still, about 30% of my strokes are actually below 150W. Those are warming up and cooling down strokes, mainly. 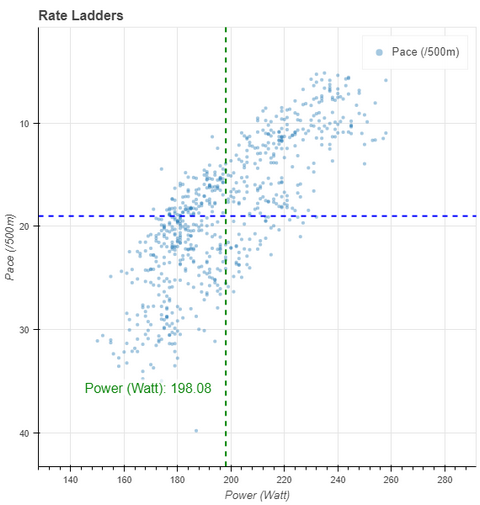 Then there is a second, wider peak around 245W, which is my “hard distance” or “threshold” power. 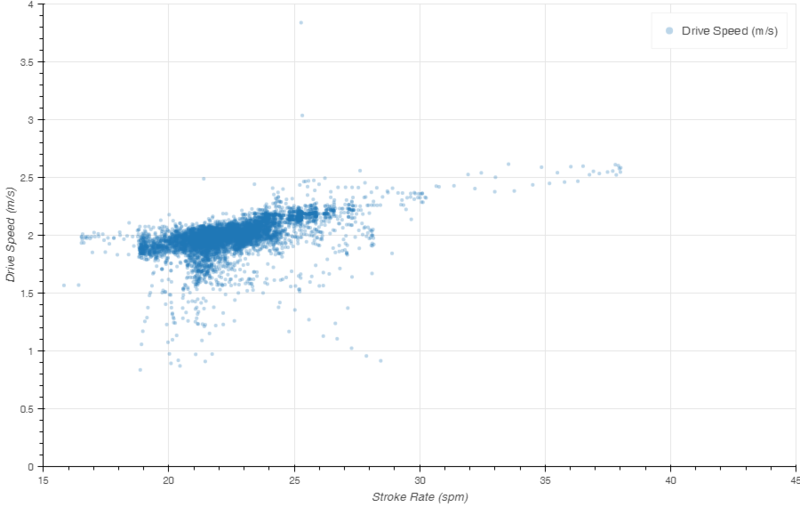 This next plot is simply the Power vs Stroke Rate. There is a funny loop up to 40SPM and 600W, which is from my “one minute full out” effort. 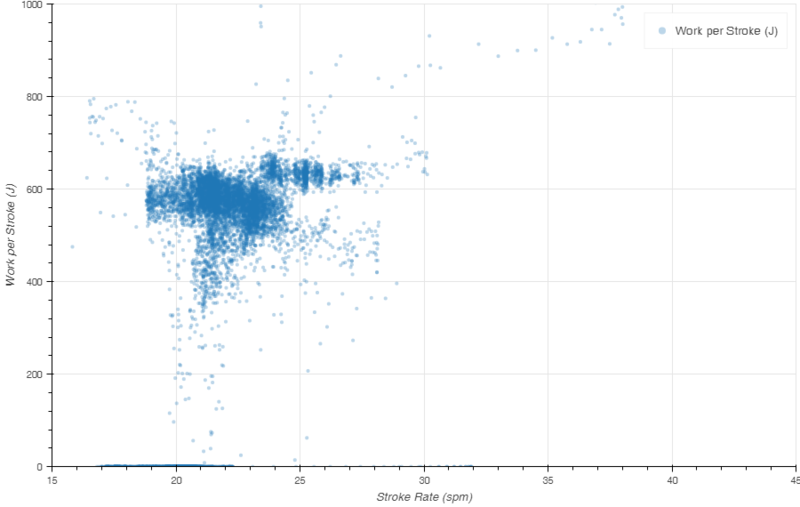 What I find interesting to see is that there are two distinct groups of power/SPM data points. The group starting at 23SPM and higher is completely separate from the group between 18SPM and 24SPM. Would that suggest that I row a different stroke for Steady State vs Threshold rowing? Here is a different look at the same data. Instead of Power, I plot the Work per Stroke (the infamous SPI which you basically get by dividing the power by the stroke rate). So it looks like in Steady State, I ease up on the strokes going to higher SPM, while in Threshold Rows, I keep the Work per Stroke around 600-625 Joule. A quick look at the drive length to see if there is anything interesting here. The “data excursions” are probably start sequences. For the rest it seems I am pretty constant at 1.4m, but there is a significant amount of slightly longer strokes. 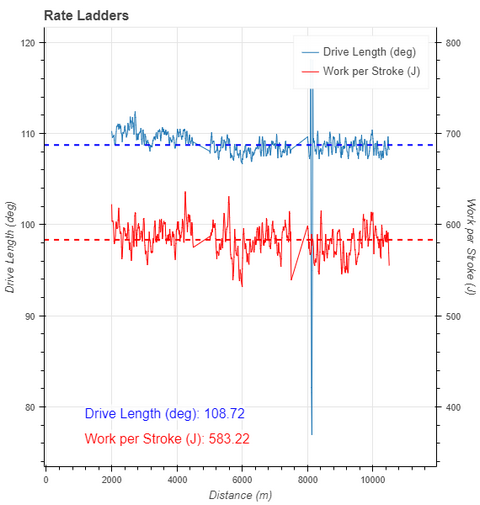 Finally, drive speed goes up with stroke rate. That seems logical. To keep the pressure on at higher flywheel speeds, you need to drive faster. 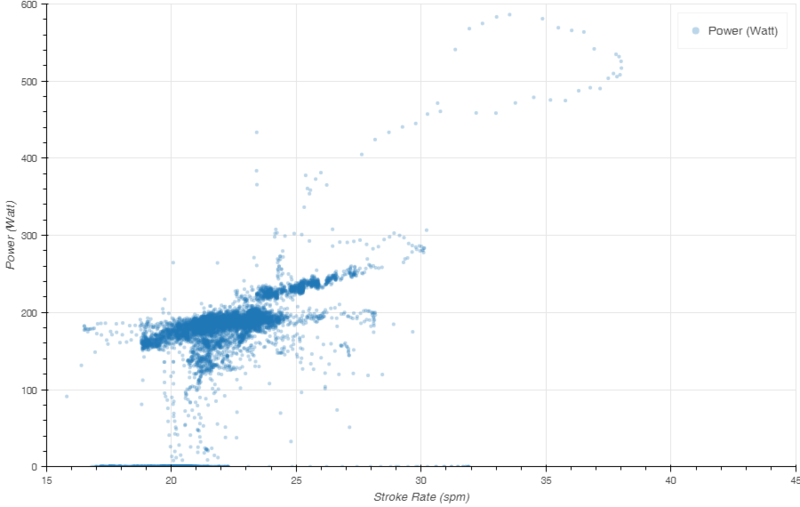 Currently, we are working on adding ways to slice the data in such a plot, and some other bells and whistles. 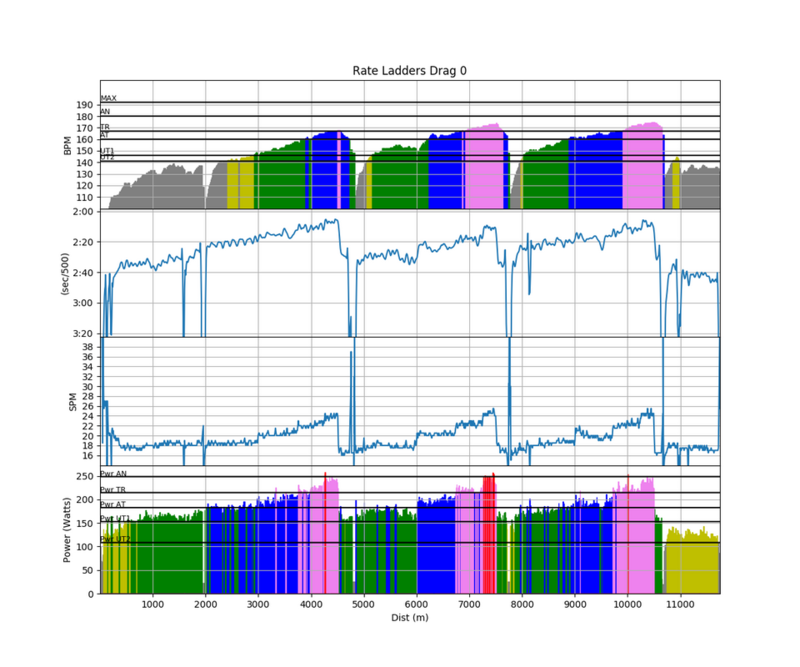 If you’re interested, drop me a line in the comments, or just register for free at rowsandall.com, start uploading your erg data and play with them.